Previous studies have linked GJB2 gene and mitochondrial DNA (mtDNA) mutations to nonsyndromic hearing impairment (NSHI), but no study in China has yet investigated these mutations across all age groups. To fill the gap, this study ascertained 263 patients with NSHI between ages 2 months and 60 years and analyzed the presence of GJB2 gene and mtDNA A1555G/C1494T mutations by polymerase chain reaction (PCR) and DNA sequencing. A total of 20 types of mutations were detected for the GJB2 gene. The GJB2 gene and mtDNA A1555G/C1494T mutations were detected in 18.63 and 11.41% cases, respectively. At the first hospital visit, GJB2 gene mutations were detected in 5.97% of adult patients (>18 years) and 22.96% pediatric patients (<18 years) (χ2 =9.506, p = 0.002), and mtDNA A1555G/C1494T mutations were detected in 31.34% of adult patients and 4.59% of pediatric patients (χ2 = 35.359, p <0.001). When patients were classified by age at onset of deafness, significantly more (20.68%) pediatric patients had GJB2 gene mutations than did adult patients (0.0%) (χ2 = 4.685; p = 0.006). Mitochondrial DNA A1555G/C1494T mutations were detected in 15.38% of adult-onset and 8.86% pediatric-onset patients, respectively. Interestingly, most GJB2 gene mutation carriers experienced NSHI onset within the first year of life (65.31%), while mtDNA A1555G/C1494T mutation carriers experienced onset at any age. Therefore, GJB2 gene mutations appear to contribute to congenital deafness, while mtDNA A1555G/C1494T mutations contribute mainly to acquired deafness in Chinese individuals. 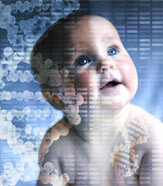 Both newborn hearing screening and genetic testing are important to diagnose and treat deafness.